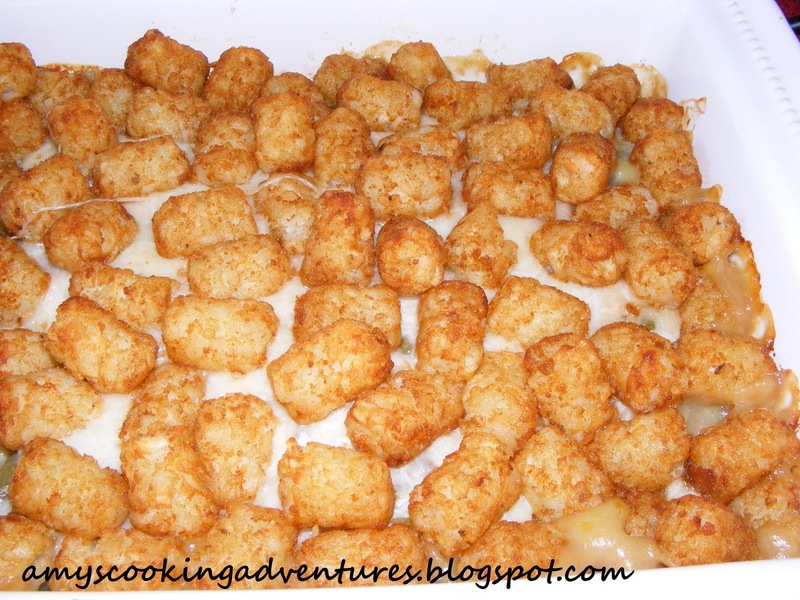 Tater Tot Casserole is one of my favorite cold weather comfort foods. Oddly enough, I never had Tater Tot Casserole until I was in college and it was served in the dining center. The college I went to was not known for its food. Really, it was one step above nuclear waste most of the time, but I really liked their Tater Tot Casserole (none of my friends agreed). When I was out of the dorms and in my first year of marriage, I decided that I would like to recreate my favorite dining center dish. I played with the recipe a bit and improved on the dining center version – I’m sure I would shudder if I had to eat it at the dining center now! This makes a large casserole that serves about 8. I always make the full size because we can enjoy it as leftovers for several days (it heats up well in the microwave). 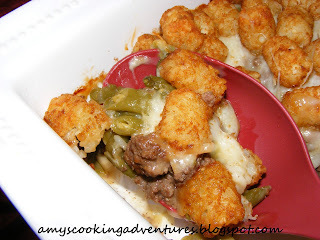 Because of the tater tots, it is also pretty kid friendly, and they might even eat a green bean or two! Place ground beef and onion together in a skillet. Cook over medium-high heat until beef is browned and onion is tender. Drain. Layer beef and onion mixture in a large casserole dish. Mix soups together and spread over beef mixture. Follow with a layer of green beans. Sprinkle the mozzarella cheese on top. Lastly, place tater tots on top in a single layer. Place casserole dish, uncovered, in the oven for 45 minutes or until tater tots are crispy and golden. I am so glad you posted this because I have heard of this famouus casserole (when we were in ND, no less) and have never known how to actually make it. It sounds like great, cold-weather, comfort food! YUM! You'll have to let me know how you like it! Enjoy! Amy, your casserole recipes are perfect for winter. Really love your hash brown casserole that you recently posted. Here in New England it's still pretty mild out ... but I suspect it will be snowing by next week. In our new cookbook, we have a recipe for Smiley Face Casserole -- a makeover of tater tot casserole. I also have the recipe on my blog. I'd love to have you make it some time and offer your opinion!! Liz - I will have to try your makeover casserole next time my family wants Tater Tot Casserole, I'm sure my son would like the smileys! It is one of our favorite recipes, thank you!